The major problem with sequence stratigraphy is that the definition, terminology and interpretation of the surfaces of sequence stratigraphy is complex and often contentious (Neal & Abrue, 2009). Terminology often involves conceptual depositional models, sea level, and/or age duration, mixing interpretation with observation, applying different genetic names to the same surfaces or deposits that depend on the model employed. In the hope of circumnavigating this, the site places a heavy dependence on the explanation of terminology linked pop-up boxes whose contents is intended to clarify the understanding and use of this discipline of stratigraphy. 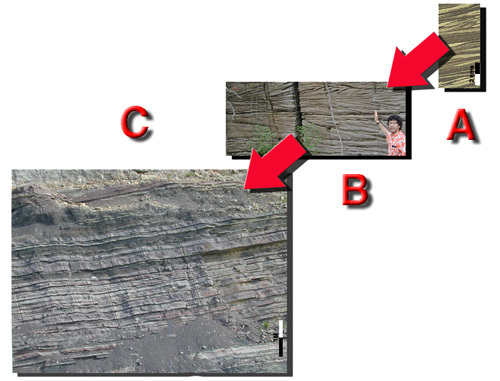 The key to using sequence stratigraphy as a tool for interpreting the sedimentary section are the major bounding and subdividing surfaces (see the banner image above). These surfaces are commonly generated by the changes in relative sea level. From the moment the oceans were first generated, their water volume and distribution across the globe has varied. This would have resulted in transgressions that caused the shore and the near-shore being flooded so transgressive surfaces (TS) formed. When the rate of sea level rise reached its most rapid change, the rate of sediment accumulating seaward of the shore slowed while from the onset of the Phanerozoic the pelagic and benthic organic matter continued to accumulate. These organics sequestered radioactive elements in the water column. The result is that from the Phanerozoic on the sediments have a strong radioactive signal on gamma logs with matching condensed sections of fossils that accumulated on a surface or in a thin zone which is known as the maximum flooding surface (mfs). In contrast, a drop in sea level may cause the shore and the near-shore to be eroded, forming sequence boundaries (SB). The characteristic geometries of accommodation successions are interpreted to differentiate the systems tracts and sequences listed below. First the interpreter reverses the order of deposition by back-stripping the contemporaneous stratal geometries from youngest to oldest, These are then reassembled in the order of successive accumulation. This reassembly uses the template of subdividing surfaces, lithofacies geometry, and fauna to interpret the evolving character of depositional setting and build conceptual models. Reassembly tracks the evolution of the sedimentary system, its hydrodynamic setting, and accommodation (see Basin Clastic Sequence Hierarchies for such a reassembly). As these sediments are reassembled, the genetic character of the sequences, systems tracts, parasequences, and beds will be seen as products of changes in accommodation. A limit to this analytical strategy is often the extent of ones understanding of the inferred depositional setting. The advantage of the strategy is it considers new questions, leading to more realistic interpretations and enhanced predictions of lithofacies heterogeneity's. Thus the sequence stratigraphic framework is used to analyze and explain how sedimentary rocks acquire their layered character, lithology, texture, faunal associations and other properties. These properties in turn can be used to explain how the mechanisms of sediment accumulation, erosion and inter-related processes produced the current configuration of these rocks. Analyses based on sequence stratigraphy apply allostratigraphic models to interpret the depositional origin of these sedimentary strata but in contrast assumes, though this is not always stated, an implicit connection of the contermporaneous strata to relative sea level or base level change. Steno and Walther's contributions to sedimentary interpretation and so sequence stratigraphy were profound. Steno established the order and the way sediments were laid down. His principle of superposition recognized that older sedimentary layers underlie the newer layers. His principle of original horizontality recorded how sediments are deposited to fill a basal irregular surface enclosed above by a smooth surface. His principle of lateral continuity proposed contemporaneous layers of sediment are continuous till they pinch out, or a barrier prevents their further spread during deposition, or subsequent abrupt changes in the landscape break up the sediment layers. Walther then recognized that as depositional settings change their lateral position and fill accommodation, so the sedimentary facies of adjacent depositional settings succeed one another as a vertical sequence. To establish the depositional setting of the sedimentary section, sequence stratigraphy uses the geometric arrangement of sedimentary fill, particularly the vertical succession of sedimentary facies geometries and their enveloping surfaces known as stacking satterns. The geometries and so stacking patterns of un-cemented carbonates and clastics are similar. This is because both respond to changes in base level, both can be subdivided by similar surfaces and both respond to wave and current movement similarly and may be transported. Though the linkage between the sequence stratigraphy and the other sub-disciplines of stratigraphy can be ‘fuzzy’ these links are important to prediction and interpretation. A key problem to strengthing theses links is not only that the terminology of sequence stratigraphy carries connotations related to the interpretation of the surfaces used to interpret the stratigraphic section but also a consideration of sedimentology and chronostratigraphy. How the terminology is defined and used and/or fits preconceived classifications is tied to the character of the data and stratigraphic techniques used. In the end it is up to the user to consider their data, and the goals of their interpretations. They should be able to explain their choice of terms and then make their interpretation! As is explained in the pages that follow, using the above approach geologists infer the processes responsible for that sedimentary rock and so interpret its origin. The sedimentary layering of a stratigraphic section has a vast array of dimensional hierarchies. These range from units millimeters thick that might be formed over seconds to thousands of feet thick and formed of millions of years. As much of the literature related to these surfaces indicates, it should be recognized that whatever the dimension of a layer is and whatever the time involved in its deposition, each layer is assumed to be contemporaneous though it is bounded by surfaces that transgress time (Wheeler, (1958); Middleton, (1973); Vail et al (1977); Galloway, (1989); Catuneanu, et al, (1998); Schwarzacher, (2000); Catuneanu, (2002); Embry, (2002); Cross, and Lessenger, (submitted)). This means an interpretation of the depositional setting for a section cut by these diachronous surfaces contravenes Walther's Law. Most interpreters accept and take into consideration that the layered units bounded by these surfaces formed at different times, and recognize that the subdividing surfaces are of a higher order frequency than the time envelope of the parasequence being considered. In other words the situation is simplified when the surfaces are taken to represent instances in time between which assumed to be contemporaneous sediments accumulated continuously over some unit of time. Thus the surfaces of the layers transgress time and the sediments filling between these surfaces also transgress time while being continuously reworked through a series of geological events. Thus it should be recognized that in sedimentary interpretation the application of Steno's principles and Walther's Law provide powerful and useful simplifications that assume the sediments packaged by surfaces accumulated within discrete moments of time, and are considered contemperaneous. If one thinks about this, these simplifications don't contravene logic (which is literally Fuzzy) and aid in the interpretation of the sedimentary section. The above discussion provides a general introduction to the subdivision of the sedimentary section by the surfaces listed above and their relationship to base level change. For for a more complete and thorough discussion of this topic you should read Catuneanu (2002). Characterize and predict of the extent of their lithofacies, particularly when associated with hydrocarbon reservoirs, and aquifers. (Posamentier et al., 1988; Van Wagoner et al., 1988). Using the sidebar menu you can select topics in sequence stratigraphy and access exercises related to this. You should be able to learn how to subdivide the sedimentary section into packages defined by bounding unconformities and internal surfaces. You will be able to see how sequences, parasequences and their associated systems tracts are the products of changes in relative sea level and rates of sedimentation. The various forms of sequence stratigraphic analyses outlined include the use of seismic cross-sections, well logs and outcrop studies of sedimentary rocks to infer changes of relative sea level and rates of sedimentation. You will be shown how to construct chronostratigrapic diagrams and also be show how to predict facies geometries and build depositional models using a variety of techniques! Later in the section on the Basics of Sequence Stratigraphy you will be introduced to the details of how systems tracts respond to changing base level. However as a preview you can trace clastic systems tract evolution through time in the linked movie!